Rather than as genuine authors listening to the divine whisper, why is each of them depicted as a copiist? I wonder where that comes from. It might be a precursor of some form of the 4 source hypothesis. A nice detail is that Mark seems to have been caught sharpening his pen. Anyone venture a guess from which Gospels manuscript these come? Correction As Elijah pointed out correctly, Mark is the one at the bottom left, and Luke is sharpening his pen. It doesn't look like they are copying the texts on their reading stands. Also can't see 'Son of God' in Mark 1.1 there. Ha, ha. In fact that would be a very good illustration of how Mark 1:1 and other Gospel incipits were abbreviated (by Irenaeus just to "αρχη του ευαγγελιου"). This circumstance speaks in favor of the long reading! Is that Luke sharpening his pen, and Mark on the bottom left? If this is the case, I clearly see IC XY, but the second line on the left page--what did he write that his pen is partially covering up? Could that be 'Son of God' somehow? I was shown a manuscript in Athens recently that had Luke copying a majuscule text, but writing his text in minuscule script just like the scribe of the MS was doing. A very interesting way of picturing Luke. Thanks Elijah, you are right, I got the two mixed up. Mark is clearly hesitating about υυ θυ. These are the Lindusfarne gospels. I wonder if the riddle has anything to do with the oneness of the Gospel of Jesus Christ (cf. Mark 1:1). There is one Gospel, and yet four. The four images were taken from minuscule 932 (ah, that one), a 14th c. manuscript kept in the Dionysiu on Athos. That an these images sum up everything I know about this artefact. I thought maybe it was 21st Century, but then I notice Matthew and Luke were only copying from one manuscript rather than 2. (If it was just look with 2 manuscripts, then I would have assumed it was 21st Century from Duke). Hmm 'look' is an interesting spelling for 'Luke', probably just an Itacism. A strikingly similar depiction can be found in the mosaics on the north and south walls of the Byzantine Basilica of San Vitale in Ravenna. Chapter 3 (I believe) of Derek Kreuger's monograph "Writing and Holiness" has a fascinating (and compelling) discussion of the phenomenon of visually depicting the evangelists in the physical act of writing. My apologies for the misspelling, that is Derek Krueger. Thanks for that Mark, I hadn't registered that book. 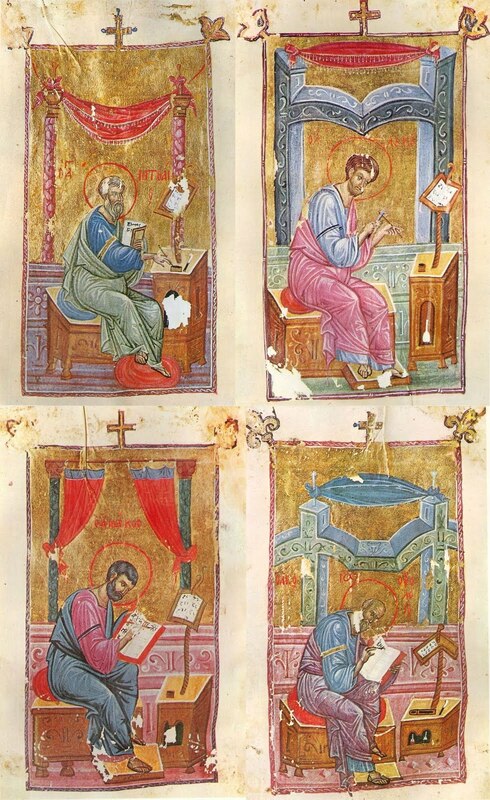 Writing and Holiness: The Practice of Authorship in the Early Christian East (details here: http://www.upenn.edu/pennpress/book/14082.html). It sounds somewhat related to Mitchell's book on Chrysostom as interpreter of Paul. There could be interesting intersections with manuscript studies. Is there really a ‘Wife-Beater’s Bible’?